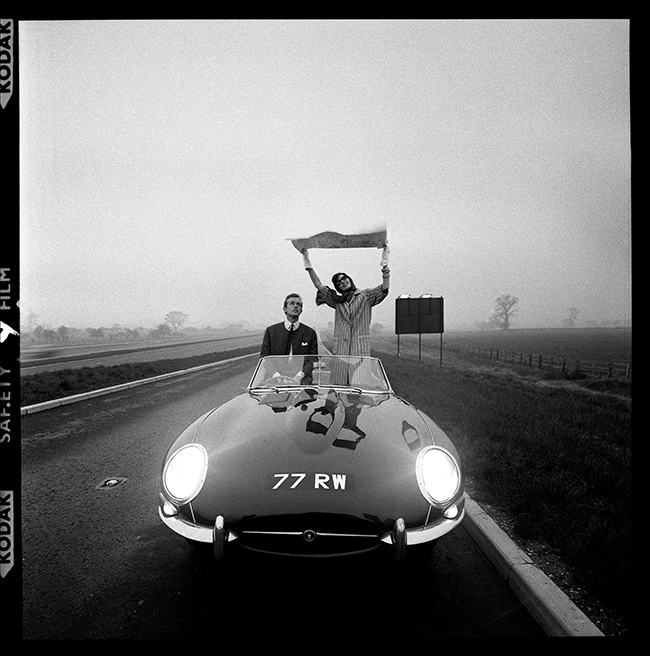 Shot for British Vogue in 1961 on the newly opened M1 motorway. The E-Type Jaguar was the very first convertible that had rolled out of the factory and was the talk of the town at the Geneva Motor Show that year. Today, it is the oldest surviving Series 1 Roadster built in February 1961. This photograph was published in British Vogue on the 1st of June 1961. The car is still turning heads and was shown on Top Gear (there’s a YouTube clip). It was also used in Pippa Middleton’s wedding ceremony. The one original owner has bequeathed it to the Jaguar Museum where it is currently on display. This image was published on the 1st June 1961 in British Vogue. Quote ref: E_548_03 if you require press information regarding this image.